The Shield Designs are very versatile. You can use them as a center design on the side of your tipi or on the back. They are particularly beautiful painted on the tipi liner in conjunction with the liner decoration strips. Most of the shield designs can be used as door designs as well. Please check our artwork pricelist for each design. Buffalo Skull Shield (#50) Adapted from a museum piece, the Buffalo Skull Shield is 3′ high by 2′ 6″ wide. Plains Shield (#51). This classic Plains style shield with a Sioux / Arapaho center design is ideal for both the tipi cover and for the door cover. 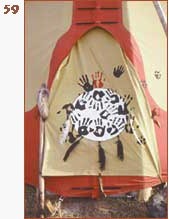 Also, used in combination with other shield designs it makes a striking interior design on the tipi liner. The Plains Shield is 3′ high by 2’6″ wide. Ceremonial Shield (#52) This beautifully designed shield exhibits the subtle balance of color and geometry typical of Plains artists. 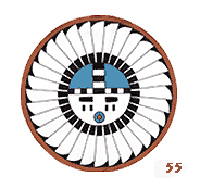 Adapted from an Assiniboine/Sioux beaded cloth, circa 1850. The design is 48″ high by 3′ wide and therefore too large for the door cover. Bear Shield (#53) This design format is 24″ wide and 40″ long. It has the ideal size for a door cover design. Dance Shield (#54) This shield is typical of the Oklahoma style dance bustle. The center design is from Sioux bead work. The Dance Shield is 3′ wide and 4′ long. This design is too large for a door cover. 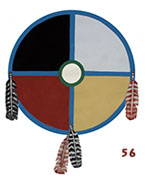 Medicine Wheel Shield (#56) The Medicine Wheel is a sacred symbol in many native traditions. The four directions and the four colors represent wholeness, while the four spokes make a path to the center. The center is the seat of the creator. The small center circle is left open (unpainted) to allow the spiritual essence of all beings to flow in and out of the medicine wheel. Rainbird (#57) Of all events in the desert life of the southwest tribes it was the coming of rain that was the most vital. The spirit that brought this life giving resource was the rainbird. The beautiful image of this sacred being is from a classic piece of Hopi pottery. Raven (#58) The Raven is a Pacific Northwest Coast motif. The Raven was regarded as a super-natural bird credited with bringing the sun, moon and fire to the world. This design is an adaptation from the Haida style. 4′ x 4′. We offer two designs that may be broken up and rearranged however you like. The basic themes are “Chasing Horses” (#61) and “Buffalo Hunter” (#62). For instance, you could have the horse with rider chasing other horses that encircle the entire tipi, or horses on the tipi without any rider. Instead of the bright color palette, you can also choose the southwest color palette or the antique wash style. In addition, we offer the horses in any other custom adaptation that you might like. Each horse or buffalo is approximately 6′ long and 4′ high.